"I WAS MADE TO FEEL QUITE SPECIAL. ALL THE TEAM LOOKED AFTER ME IN A PROFESSIONAL MANNER." 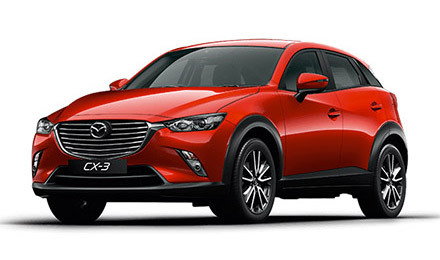 Read our customers' honest and impartial Mazda CX 3 car reviews and ratings to easily find your next car at Motorparks. The car is excellent and the professional service received whilst buying it has made this an excellent driving experience. Really enjoying the extra power/acceleration and a very smooth drive as the suspension is good. This is the second time I have purchased a brand new Mazda CX-3. I didn't look any further than a Mazda when I decided to upgrade to a new car as these are the best cars I have ever owned. Performance, reliability - they are all here in a Mazda, don't waste time looking any further. I had great fun buying my new Mazda CX3. It's a fun car to drive and amazingly economical. Thank you so much to Chris and Johannes for looking after me so well. Comfortable, spacious inside, some blind spots but nothing to pressing. Free mats would have been appreciated. This is the first time I've ever bought a new car. In the past I have always said I would not buy a new one because of the small problems you always get, or so I thought. During the test drive of my new CX3 sport Nav I found it very easy to drive and very comfortable. A point to note is that to make entry into both front seats the squabs can be raised or lowered to make it easier so anyone with slight mobility problems could find this helpful. I am really pleased with the way the car handles in different road conditions and coupled with this is the economy is excellent. The interior trim and standard accessories are very high as is the exterior finish on the car. My CX-3 is a sleek looking car. It is the new 1.8D sport nav&plus; and it handles really well. Acceleration is good BUT there is a slight dip when gear changing until the turbo kicks in again. However, overall performance is superb. The mileage to date is an average of 53mpg and again, this is very good. Comfort in the front is really exceptional and all round visibility good. Access to the controls is comfortable and ease of use of controls is very good. I have only had the vehicle just over a month so I can only give initial feedback. The vehicle has been excellent and I am very pleased with my purchase. The only issue that I have is with the infotainment system which regularly randomly reboots and bugs within the navigation software. I am hoping these faults can be eliminated with an update to the software. Very happy with my purchase of my CX-3. It handles very well and fuel consumption is as good as stated. I can get my motorised golf trolley, golf bag and suit bag in the storage area with room to spare. The information system is state of the art and very easy to use.